Ken Rasmussen is the director and a professor in the Johnson Shoyama Graduate School of Public Policy's University of Regina campus. Prior to assuming this new role, Ken served as the JSGS Associate Director from 2008-13, where he provided guidance in developing the school’s academic programs. 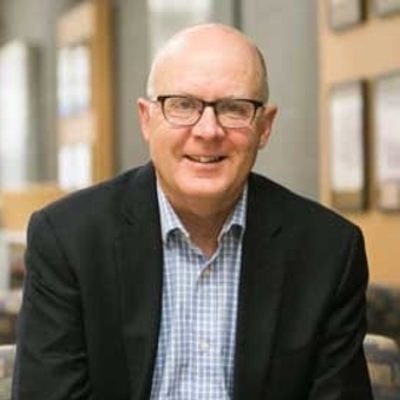 Rasmussen's main research interests include public enterprise management, administrative reform, administrative history, non-profit organizations, ethics and leadership, and provincial politics. Download Ken Rasmussen's abridged CV. Atkinson Michael M., Daniel Béland, Gregory P. Marchildon, Kathleen McNutt, Peter W. B. Phillips, and Ken Rasmussen. 2013. Governance and Public Policy in Canada: A View from the Provinces. Toronto: University of Toronto Press. Luc Juillet and Ken Rasmussen, Defending a Contested Ideal: Merit and the Public Service Commission, 1908-2008 (Ottawa: University of Ottawa Press, 2008). (Toronto: University of Toronto Press, 2008). Ken Rasmussen, “Converging Provincial Public Services” in Christopher Dunn, (ed.) Provinces: Canadian Provincial Politics (Toronto: University of Toronto Press, 2016), 422-441. Ken Rasmussen, “Saskatchewan.” in Jared Wesley (ed.) 10 Worlds: Politics and Elections in Canada’s Provinces. (Toronto: University of Toronto Press, 2015). James Agarwal, Dave Malloy, Ken Rasmussen, "Ethical Climate in Government and Nonprofit Sectors: Public Policy Implications for Service Delivery" Journal of Business Ethics, Accepted for publication. Ken Rasmussen, "‘Super Diplomat and Super Expediter': Wes Bolstad as Cabinet Secretary in Saskatchewan, 1973-79" in Patrice Dutil (ed.) Searching for Leadership: Secretaries to Cabinet in Canada (Toronto: University of Toronto Press, 2008). Carolyn Jones and Ken Rasmussen, "Institutions for Water Resource Conflict and Management in Canada" Mark Sproule-Jones, Carolyn Johns and Tim Heinmiller (Eds) Canadian Water Politics: Conflicts and Institutions (Montreal/Kingston: McGill-Queen's University Press, 2008). Greg Marchildon and Ken Rasmussen Edward Richard Schreyer. 1969-1977 in Robert Wardaugh (ed.) The Premiers of Manitoba (Regina: CPRC Press, 2008). Ken Rasmussen and Gregory P. Marchildon, "Saskatchewan's Executive Decision-Making Style: The Centrality of Planning" in Howlett and Brownsey (eds) Executive Styles in Canada (Toronto: University of Toronto Press, 2005). Ken Rasmussen, "Canada's Water Management System: Economic Development and Institutional Paralysis" in J.C.N Raadschelders (ed.) The Institutional Arrangements for Water Management in the 19th and 20th Centuries (Amsterdam: ISO Press, 2005), 179-194.